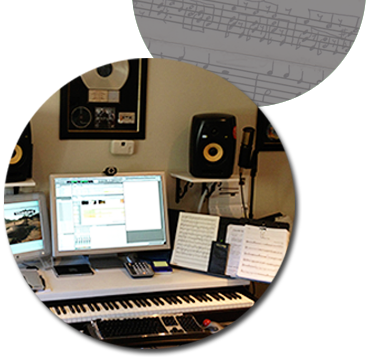 Recording Studio | Richard Altenbach, composer, violinist. As well as featuring many sophisticated sampling and beautiful reverb libraries, our recording studio, Bachiosaurus Studios, utilizes state-of-the-art mixing and mastering software for any digital audio recording needs. Although much of our sound recording work is done “in-the-box” (that is, with software within the computer), we also support live recording of individual instruments or vocals with excellent click-track & monitoring capabilities. several percussion libraries, many electronic synth libraries, and a plethora of SFX!